Good morning folks, In today's article, we are going to discuss one of the frequently asked bit manipulation based interview question, how do you count the number of set bits in given bit sequence? Bit Manipulation is an important topic on programming interview and a good programmer should have sufficient knowledge and skill to work with binary numbers. This kind of questions tests that skill of the programmer. Sometimes, it is also asked as for how to count the number of 1s (ones) in given number? Both are the same question because 1 is also known as set bit. For example, if given input is 1000110010 than your program should return 4, as three are only four set bits in this bit sequence. There are many techniques to solve this problem and you might have your unique way as well, but let's explore some tried and tested a way to solve the problem. Btw, if you are the first time seeing this problem then I suggest you solve it yourself first because the best way to learn why a given algorithm works are to take a pencil and run through a few examples. The solution presented in this article, you might have seen this already in hackers delight, runs through a loop and clears the lowest set bit of number during each iteration. This means you must know how to move bits and how to test a particular bit to find whether it's one or zero. When no set bit is left in the number i.e. number becomes zero then the number of iterations is returned. That's your number of 1s or set bits in given bit sequence. Let's learn more about how this algorithm works. Btw, I am assuming that you are familiar with binary numbers and understand how they are represented in Java e.g. in 2's complement form. I also assume that you know how to use bitwise operators like &, | and ^, I mean bitwise AND, OR and XOR operators, and bit shift operators like <<, >>, and >>> i.e. left shift operator, right shift operator, and right shift without sign operator. If you are not familiar with them then I suggest you to first understand them by joining a comprehensive course like The Complete Java MasterClass, otherwise, it would be really difficult to understand and solve bit manipulation based problems. Once all set bit will be cleared number will become zero and your loop should stop there. The number of iteration required is equal to a number of set bits in given number. The second step is most important where we are using bitwise AND operator, to clear the least significant bit of number. 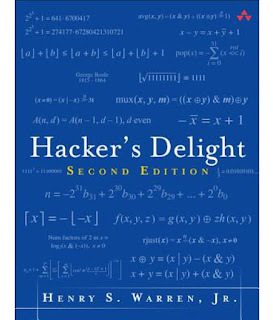 If you cannot understand it on your own, I suggest you read Hacker's delight at least once. One of the best book for Programmers interested in learning binary, and you know, there are only two types of programmers, one who know binary, and others who don't. If you have difficulty reading this book, which is quite possible becuase it's not one of the easiest book to read, I also suggest to check a good data structure and algorithm course like Data Structures and Algorithms: Deep Dive Using Java which covers this topic in much more simpler language. Here is our Java program which is based upon the first algorithm we have seen in this article. It's one of the simplest ways to count the number of set bits in given binary number in Java. If you have any difficulty understanding this program, feel free to comment. * Java method  to calculate number of set bits in a given bit sequence. 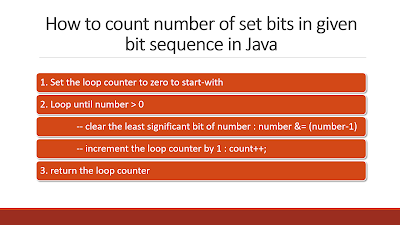 That's all about how to count the number of set bits or 1s in the given bit sequence in Java. If you are interested in learning more about how to work with bits and bytes in Java, I strongly suggest you join a good course on Algorithms like Algorithms and Data Structures - Part 1 and 2 one of the best books to learn binary manipulation. It contains many essential tricks to deal with bit sequence. P. S. - If you don't mind learning from free resources then you can also check this list of free algorithms courses to start with. awesome work. keep it up!! !